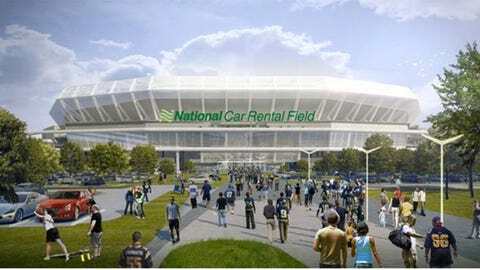 An artist's rendering of a proposed new NFL stadium in St. Louis with naming rights belonging to National Car Rental -- a source of a chunk of what the city would pay for the facility. ST. LOUIS — St. Louis city will pay $6 million a year toward a new riverfront football stadium and rebate an undetermined portion of game-day taxes to the team, according to a newspaper report Friday that cited draft measures by the city’s governing board. The yearly $6 million is the same amount that now covers debt payments on the current Edward Jones Dome, covering roughly $70 million of the $150 million that Mayor Francis Slay’s office has committed to the billion-dollar project’s construction and planning, the St. Louis Post-Dispatch reported. It’s unclear if St. Louis will have an NFL team when the stadium is finished. Rams owner Stan Kroenke is seeking to move his team to Los Angeles. Slay’s chief of staff, Mary Ellen Ponder, said Friday that she anticipates the measure will be introduced at next Friday’s board meeting, though she cautioned that the legislation obtained by the newspaper is a draft, with important holes still being negotiated. "The best deal for the city can’t be looked at by direct revenues only," she said. "You have to look at the intangible benefits of keeping the NFL, and ideally the Rams, in the city."